Our lab is interested in replication, repair, and maintenance of mitochondrial DNA (mtDNA). We utilize a variety of genetic and molecular techniques to identify proteins that function in these pathways, in order to better understand the unique requirements of this subcellular genome. Mitochondria are important eukaryotic organelles. They are usually pictured as static, bean-like shapes floating within the cytoplasm, but they are in fact marvelously dynamic structures that fuse and divide in response to cellular demands. Moreover, their involvement in cellular processes and architecture is almost certainly more extensive than previously imagined. Mitochondria are familiar to most people as the powerhouses of the cell, as they are responsible for the conversion of metabolic intermediates into cellular energy in the form of ATP. As a byproduct of this process, mitochondria are also the major source of intracellular reactive oxygen species, or free radicals. 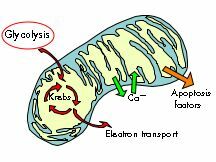 Additionally, however, mitochondria also serve as agents of calcium homeostasis and regulators of apoptosis, both of which are central to cellular integrity. Failure to maintain mitochondrial function, therefore, results in cellular dysfunction, which in multicellular organisms can mean disease. Mitochondria contain their own genomes, encoding proteins essential for respiration and oxidative phosphorylation. Maintaining error-free mtDNA is necessary for proper mitochondrial function. Not until the mid-1980s were the first mitochondrial diseases identified, but since that time the field of mitochondrial medicine has grown considerably. Relative to the nuclear genome, however, knowledge of the genes involved in mtDNA stability and the molecular actions of their encoded proteins is sparse. 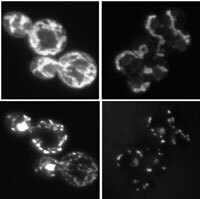 Stained mitochondria in wild-type yeast (left) and the mutant msh1-G776D, defective in mtDNA stability. Maintenance of mtDNA is linked to structural stability of the organelle. Top panels show mitochondrial structures, bottom panels show mtDNA. The goal of our lab is to understand the processes that govern mitochondrial DNA. Many of these are likely to be similar to those that occur in nuclear DNA. However, mtDNA is unique in several aspects. It is extremely AT-rich, highly repetitive, and multi-copy. Additionally, in higher eukaryotes it is almost exclusively maternally derived, and is therefore subject to different evolutionary forces as well. Our work focuses primarily on genetic analysis of genes known to function in mtDNA metabolism, including the mitochondrial polymerase Mip1p (Pol gamma), the mismatch repair homolog Msh1p, and the maintenance protein Mgm101p. For much of this work we utilize DNA reporter constructs that allow us to measure rates of mtDNA alterations both by mutation and recombination. We are also conducting screens to identify pathway partners of these known genes and in this way contribute to what is known about the yeast mitochondrial proteome. Stein, A, L Kalifa, and EA Sia. 2015. Members of the RAD52 epistasis group contribute to mitochondrial homologous recombination and double strand break repair in Saccharomyces cerevisiae. 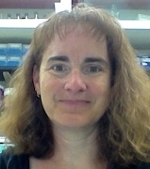 PLoS Genetics, 11: e1005664. doi:10.1371. Kalifa, L, JS Gewandter, RJ Staversky, EA Sia, PS Brookes, and MA O’Reilly. 2014. DNA double-strand breaks activate ATM independent of mitochondrial dysfunction in A549 cells. Free Radical Biology and Medicine, 75:30-39. SA Mookerjee and EA Sia. 2013. Using genetic reporters to assess stability and mutation of the yeast mitochondrial genome, Genetic manipulation of DNA and protein - Examples from current research, Dr David Figurski (Ed. ), ISBN: 978-953-51-0994-5, InTech, Available from: http://www.intechopen.com/books/genetic-manipulation-of-dna-and-protein-examples-from-current-research/using-genetic-reporters-to-assess-stability-and-mutation-of-the-yeast-mitochondrial-genome. Kalifa L, DF Quintana, LK Schiraldi, N Phadnis, GL Coles, RA Sia, and EA Sia. 2012. Nuclear nonhomologous end-joining proteins impact spontaneous mitochondrial direct-repeat mediated deletions and double-strand break repair. Genetics, 190(3) 951-964. Scott DA, EA Sia, M Brockett, WD Fixsen, and DK Lavitt. 2011. Solutions Manual for Introduction to Genetic Analysis, 10th edition, W. H. Freeman and company, New York, NY. Kalifa, L., G. Beutner, N. Phadnis, S-S Sheu, and E.A. Sia. 2009. Evidence for a role of FEN1 in maintaining mitochrondrial DNA integrity. DNA Repair, in press. Pulicherla, N., L.A. Pogorzala, Z. Xu, H.C. O'Farrell, F.N. Musayev, J.N. Scarsdale, E.A. Sia, G. M. Culver, and J.P. Rife. 2009. Structural and functional divergence within the Dim1/KsgA family of rRNA methyltransferases. J. Mol. Biol, in press. Pogorzala, L.A., S.A. Mookerjee, and E.A. Sia. 2009. The mitochondrial MutS homolog, Msh1p, plays multiple roles in base excision repair. Genetics, epub ahead of print. Sia, R.A.L., S. Carrol, L. Kalifa, C. Hochmuth, and E.A. Sia. 2009. Loss of the mitochondrial nucleoid protein, Abf2, destabilizes repetitive DNA in the yeast mitochondrial genome. Genetics181: 331-4. Kalifa, L. and E.A. Sia. 2007. Analysis of Rev1p and Pol zeta in mitochondrial mutagenesis suggests an alternative pathway of damage tolerance. DNA Repair6: 1732-1739. Phadnis, N., R. Mehta, N. Meednu and E.A. Sia.2006. Ntg1p, the base excision repair protein, generates mutagenic intermediates in yeast mitochondrial DNA.DNA Repair5: 829-839. Mookerjee, S.A. and E.A. Sia.2006. Overlapping contributions of Msh1p and putative recombination proteins Cce1p, Din7p, and Mhr1p in large-scale recombination and genome sorting events in the mitochondrial genome of Saccharomyces cerevisiae.Mutat. Res.595: 91-106. Mookerjee, S.A. and E.A. Sia.2005. Analysis of the functional domains of the mismatch repair homolog Msh1p and its role in mitochondrial genome maintenance.Curr. Genet.47: 84-99. Phadnis, N., R.A. Sia and E.A. Sia.2005. Analysis of repeat-mediated deletions in the mitochondrial genome of Saccharomyces cerevisiae.Genetics171: 1549-1559. Sia, E.A. and D.T. Kirkpatrick.2005. The yeast MSH1 gene is not involved in DNA repair or recombination during meiosis.DNA Repair4: 253-261. Phadnis, N. and E.A. Sia.2005. Role of putative structural protein Sed1p in mitochondrial genome maintenance.J. Mol. Biol.342: 1115-1129.